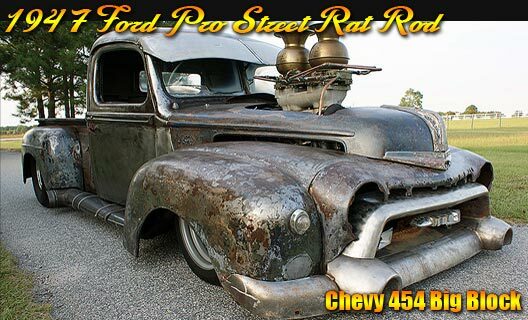 "Race Quality Built (by Experienced Race Car Builder) "
1947 Ford PRO Youtube vids. 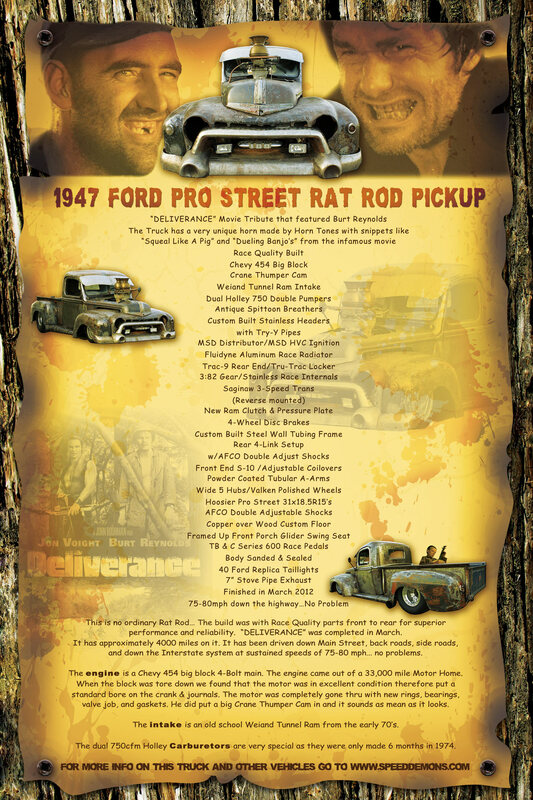 1947 Ford PRO STREET Rat ROD Pickup "DELIVERENCE"
This is no ordinary Rat Rod… It was designed and built by a 20 year experienced Winston Cup builder. 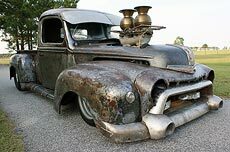 The build was with Race Quality parts front to rear for superior performance and reliability. “DELIVERENCE” was completed in March of this year and it has approximately 4000 miles on it. It has been driven down Main Street, back roads, side roads, and down the Interstate system at sustained speeds of 75-80 mph… no problems. 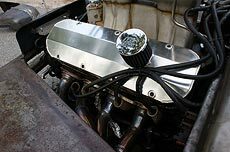 The engine is a Chevy 454 big block 4-Bolt main. 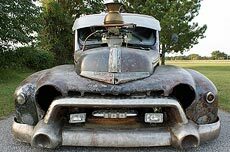 Jimmy got the engine from a 33,000 mile Motor Home. 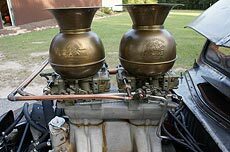 When he tore the block down he found that the motor was in excellent condition therefore he put a standard bore on the crank & journals. The motor was completely gone thru with new rings, bearings, valve job, and gaskets. He did put a big Crane Thumper Cam in and it sounds as mean as it looks. The intake is an old school Weiand Tunnel Ram from the early 70’s. The dual 750cfm Holley Carburetors are very special as they were only made 6 months in 1974. They were the only Holley’s built with lines on both sides and very valuable from what I understand. The two antique Spittoons being used as breathers took 4 days to find! The Valve Covers are handmade & fabricated and these are NOT the cheap made Chinese knock offs. These are the real deal! The stainless headers are completely custom built and with Try-Y Pipes. 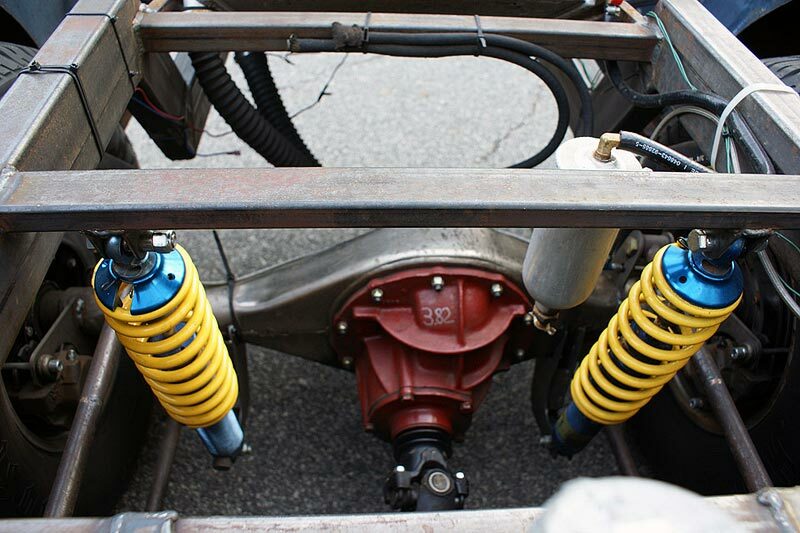 Other features are MSD distributor, MSD HVC Ignition, all race quality lines, fittings, supports, and brackets. 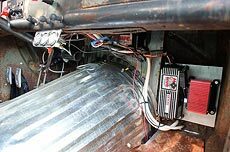 The main radiator is mounted in the rear and it is a Fluidyne High Performance with Marine high temp hoses running to it. The starter is a Powermaster XS Torque Starter. The side pipes & exhaust are 7” Stove Pipes… That’s Right, stove pipes and sound awesome! The transmission is a Saginaw 3-speed and it is mounted in reverse to get the shifter over where it needs to be. The clutch is a new Ram clutch & pressure plate. 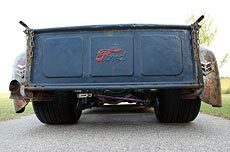 The narrowed rear end has a Trac-9 Housing with a True Trac Locker out of a Winston Cup car and with a 3.82 gear. All of the internals are race stainless parts. The rear hubs are Wide 5. 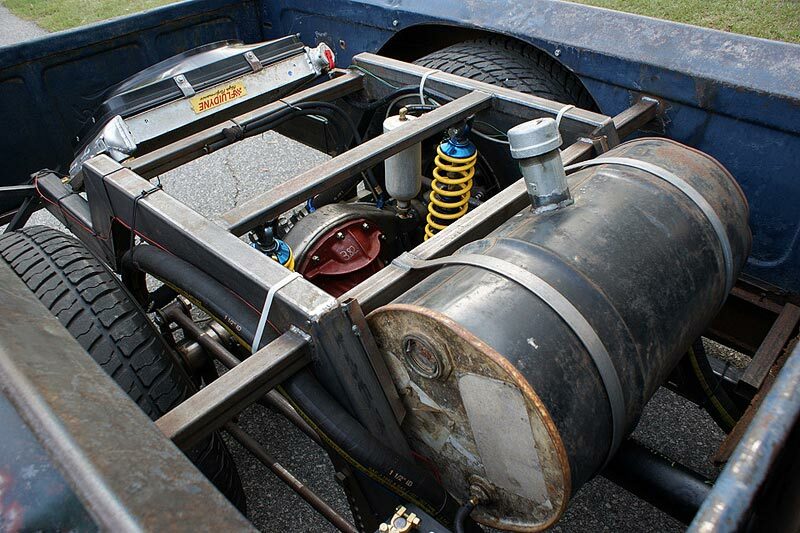 The drive shaft is brand new and custom cut and built with Chevy front and Ford rear. 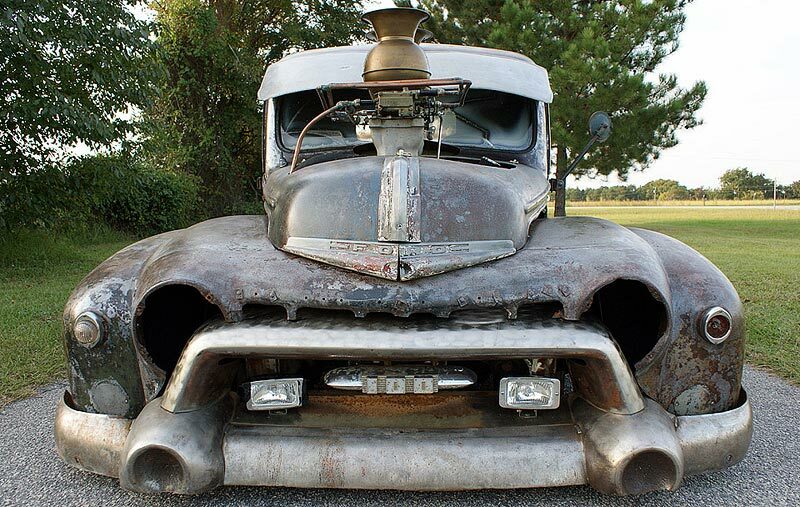 The gas tank is coated inside so no need to worry about rust. The front suspension (firewall forward) is Chevy S10 with S10 steering, powder coated tubular A Arms, and adjustable coil over shocks. The frame is hand built with Steel wall tubing and the rear shocks are AFCO double adjustable (compression & rebound)…The shocks are $2500 apiece new! 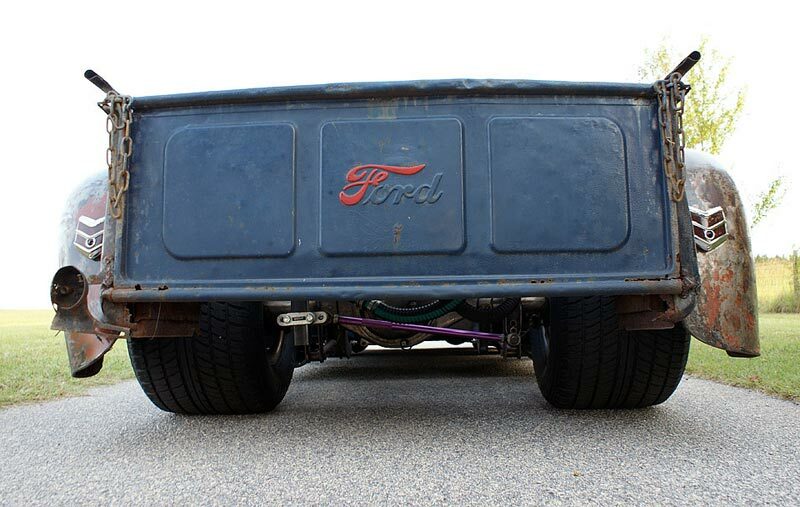 It has the 4-link setup in the rear as well. 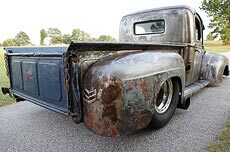 The body on the truck was sanded down fairly smooth to the metal with enough Patina and paint left for a nice contrast, and then coated with a ceramic tile water based sealer and it has worked very well. The hood is a lift off with 3 pins. The tail lights are 40 Ford replicas. 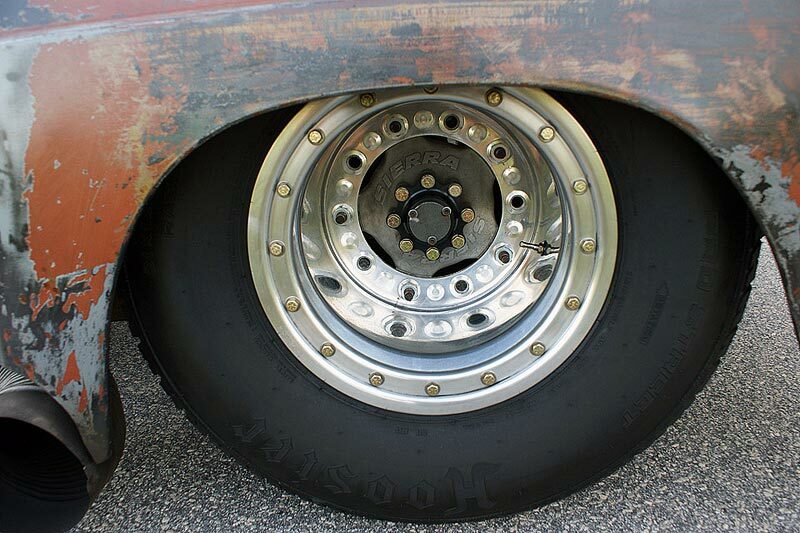 The rear wheels are Valken polished aluminum with Hoosier Pro Street 31x18.5R156LT’s. The interior is all custom built of course with some very unique features. The floor is a sheet of copper with swirl marks from a scotch brite wheel over a treated plywood frame. Sitting on top of the copper floor is an old fashioned front porch Glider Swing all framed and as sturdy as can be. These Glider Swings are hard to find and bringing real good money in the antique world. 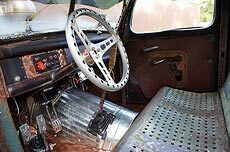 The floor pedals are TB & C Series 600 Race pedals. The truck was finished in March of this year and was immediately put on the road. 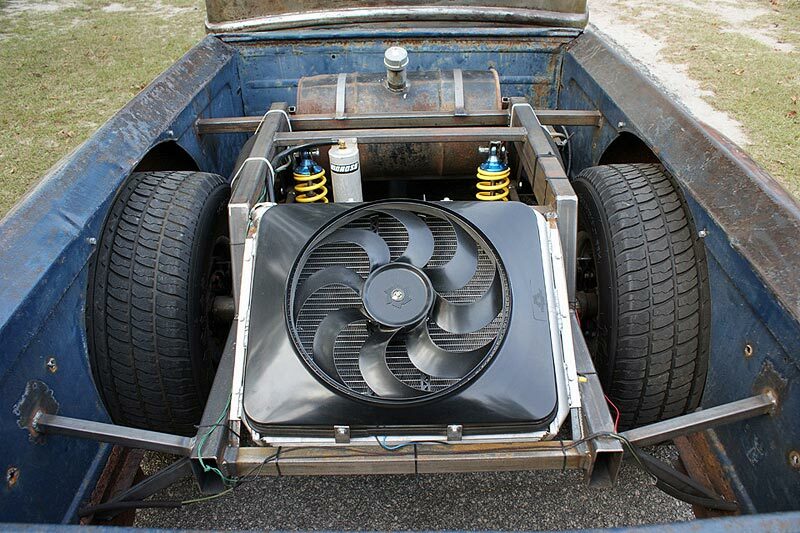 miles and can be driven around town in heavy traffic or down the highway at speeds of 75-80mph with no problem. This truck has a cool factor that is off the charts and it is the absolute star of the show no matter where it is! The new up and coming band “Honeysuckle Ridge” with lead singer Jody Lee Petty used this truck on their new album cover which will be coming out soon. 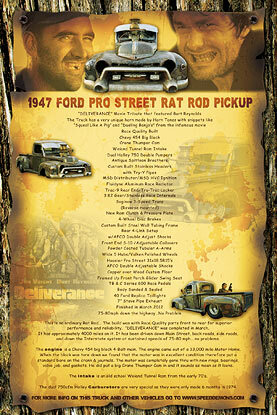 It is also shown in this month’s Hot Rod Magazine on page 20. This truck was built with all Race quality parts and materials which are 10 times better than your normal parts. It was built by a 20 year race car builder and it is as unique as they come.